For many Newfoundlanders and Labradorians, the fishery is an integral part of our way of life, and this was certainly the case for Cathy Dimmer. At the age of 16, she went to work at the High Liner Foods fish processing plant in Burin. This is where she remained for the next three decades. In 2012, the company announced it was shutting down the plant. Cathy was devastated. She, along with many other workers, were placed in a very tough position. “I had no education. I didn’t know where to start or what I was going to do.” Cathy was overwhelmed but determined to find a new career path. She took the initiative and contacted WRDC to inquire about the Orientation to Trades and Technology (OTT) program. “The OTT program made me realize I could do anything I set my mind to. 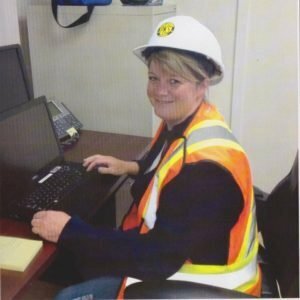 It also gave me the confidence I needed to obtain my education.” Not only did Cathy receive her diploma in Occupational Health and Safety (OHS) from Keyin College, she also graduated top of her class with the highest academic score … a 93% overall average!